Arizona Voters were able to see for the first time and only time this election season the two party nominees vying to succeed Senator Jeff Flake in the November elections. People watching were treated to two candidates, Representative Kyrsten Sinema, and Representative Martha McSally who both displayed contrasting visions and temperaments to the viewing public. Democratic nominee Representative Kyrsten Sinema came across as poised, prepared, mature, approachable, bipartisan and wonky. On issue, after issue, be it healthcare, Brett Kavanagh, border security, climate change, or the economy, she skillfully laid out for the audience her positions and why she supported or opposed differing policy initiatives or nominees. She conducted herself professionally when attacked by her opponent, calmly refuting each assertion brought on by her. In sharp contrast, Representative Martha McSally came across as unhinged, inflexible, bombastic, animated, and untruthful. On issue after issue, she continually parrotted Republican talking points on the border, health care, the economy. taxes, and Brett Kavanaugh. She brought up Nancy Pelosi (the Republican boogeyman of the last 12 years) at least twice and when it came time for her response to the topic of climate change, she immediately demanded to shift the topic to the military where she regurgitated all the proven misleading, inaccurate, and false accusations against Representative Sinema, even “slinging mud” by accusing her of treason for remarks made in 2003 (long before the Democratic Nominee ever held office). 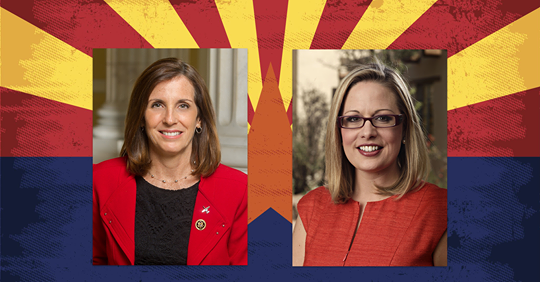 Please click on the below links to see the debate and a fact check from supporters of the Sinema campaign.